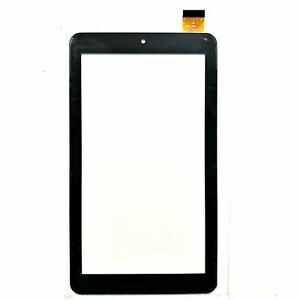 7 inch alba tablet screen replacement. This replacement screen is a life saver. Delivery was quick, well packaged. There's an YouTube video of the tablet been stripped down, but to be fair, All I done was to carefully unclipped the back. Remove some of the anti static tape, must reuse. Remove the three tiny screws that hold the mother board. No need to remove the mother board. Then used a heat gun on low setting to soften up the adhesive for about 5 minutes. Used my finger nail and very small flat screwdriver to remove from the frame. Once removed, I carefully raised the mother board to make room for the ribbon cable to come through. Prepped the tablet frame using white spirit and a Stanley blade. I would recommend testing the new screen first before final fit. Was amazed how easy this repair is. Pretty much self explanatory. Easiest way is to have the lcd facing upwards pop the ribbon through the slot and carefully bond down the screen this way gives you lots of control because once it’s stuck it’s stuck !! Thanks very much for a super fast delivery and excellent product. The product itself is amazing , but hard to put on. Thats not the products fault. For some help , you have to take the back off first then the screen with the sticky stuff pulled off (the tricky part) then you can put the screen on . But the product itself great for the price , little laggy here and there but what do you expect . I would defo recommend as its a good price.